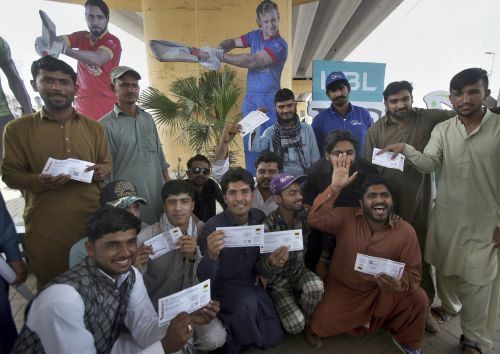 South Africa's Cameron Delport delighted thousands of cricket-starved fans at Karachi's National Stadium with a blistering century as the Pakistan Super League returned to the country's biggest city on Saturday. Delport's unbeaten 117 off 60 balls, including 13 fours and six towering sixes, propelled defending champion Islamabad United past Lahore Qalandars and into the playoffs. Karachi hadn't hosted a PSL game since last year's final, and wasn't scheduled to this year. But Lahore was ruled out when its air space was temporarily closed recently during heightened political tensions between Pakistan and India. After staging 26 PSL league matches in the United Arab Emirates, the Pakistan Cricket Board still wanted to play the remaining eight games — four league matches, four playoffs including the final next weekend — in Pakistan. Karachi was chosen to stage all eight to show again to the cricketing world that Pakistan can safely host international teams. "The perception that foreigners have about the safety situation in Pakistan will change and they will be satisfied with the security arrangements," PCB chairman Ehsan Mani said in Karachi. "I am delighted to welcome the foreign players who have come here for the PSL, and I am sure it will help us in bringing more international matches to the country." In a recent interview with The Associated Press, Mani said Bangladesh and Sri Lanka could tour Pakistan this year if the PCB successfully organizes PSL games in Pakistan. It's been 10 years since Pakistan hosted a top bilateral series, after the Sri Lanka team were attacked by terrorists in 2009 in Lahore. Key cricketing delegates from around the world will monitor security arrangements during the matches in Karachi. Tight security will be provided for the six franchise teams, including more than 13,000 policemen and 2,500 paramilitary personnel in place from the team hotel to the stadium, and around the National Stadium. Hundreds of CCTV cameras have been installed in and around the stadium, and spectators have to show identity cards at entry points with metal detectors. Even with all that security, the 32,000-capacity stadium was more than half full long before the 7 p.m. local time start on Saturday. Beside Delport, other international stars who will feature in the remaining Twenty20 league games include Shane Watson of Australia, and Kieron Pollard and Darren Sammy of the West Indies. Sammy leads Peshawar Zalmi, won the second PSL at Lahore in 2017. Watson will be playing in Pakistan 14 years after touring here with Australia A. It's the first time for Pollard. "It's been 14 years since I last visited Pakistan, a place with some of the most passionate fans in world cricket," Watson said in a video message tweeted by his team Quetta Gladiators. "Can't wait to give it our best shot in winning the trophy."